Recently a haze of childhood memories clouded my mind struggling to become clear. I was back in the city of my early years, revisiting the people and places that were so much a part of my early life. To my Italian relatives, especially my elderly aunts, those formative years were still clear. It was easy for them for they never left Sault Ste. Marie. They never abandoned the memories. I, unfortunately, did for a different life in a different place. I depended on their stories to bring those days into sharper focus. 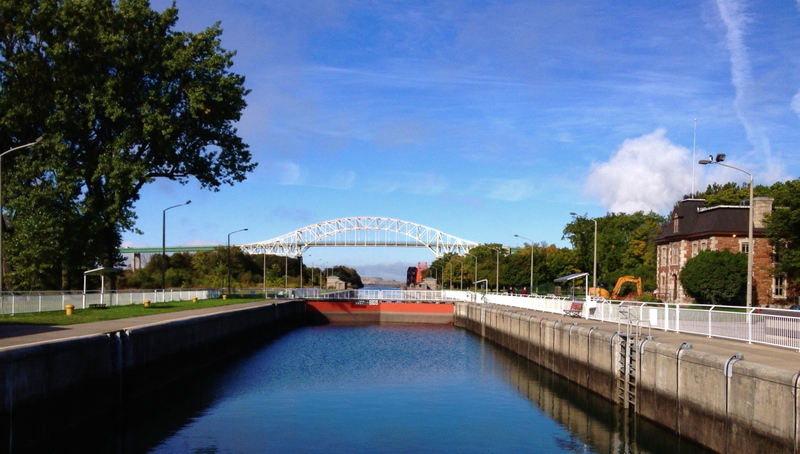 One morning, I walked with N. to the now closed Soo Locks where I use to come to watch the big Lakers carefully creep through the canal leaving barely enough room on either side. I would marvel when the water gates closed at their stern and marvel even more when water levels rose lifting the ship ever so slowly up to meet the open expanse of the St. Marys River, before it crept away creaking and groaning under dead slow speed. 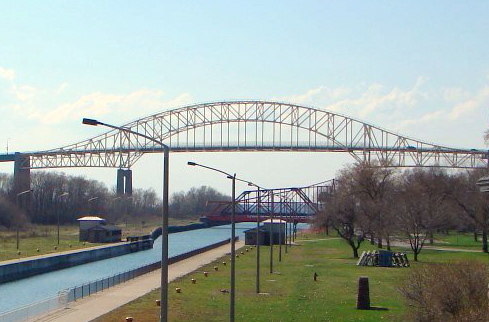 Looking down the length of the waterway I saw the long span of the International Bridge to Soo Michigan rising over the river. Beneath it, rusting and abandoned was the old rail bridge. It didn’t take me long to remember what childhood friends and I did there on lazy Sault Ste. Marie summer afternoons. Railway tracks ran behind our schoolyard straight to the trestle. We would follow them, running between the steel rails trying to stay on the railroad ties and not touch the thick gravel. We paused only when we spotted a spike sticking up above the wood. This was a prize we stopped to pry loose. It was only when we approached the trestle that we slowed down. Here we had to be careful. As we moved out under its steel span the ground gave way to open air. We were suspended over water now. To us, it was a long way to fall. We stepped carefully from tie to tie, yelling at the top of our lungs partly to keep fear at bay and partly to prove that we knew no fear. To hestitate would invite the taunt, “codardo, codardo, codardo, andare a casa di mamma.” Translated it branded you a sissy telling you to, “run home to mamma you coward.” None of us ever did. Once across and before we ran down the embankment to the river we always looked back. It was in that one brief silent moment that we realized it was our only path. We knew the times when the freight trains rolled through so we were sure of safe passage home. And when the whistle blew for the sift change at the steel plant we knew we must be on our way. A freight was due through about an hour after that. Any later getting home would always mean trouble. Somehow our mothers knew where we had been even though they repeatedly forbid us to go there. There is a river of memories that flows through us all. Its source springs from things past. These memories are but embers sitting silently, buried deep in our soul. All we need do is breathe on them gently to ignite a remembrance of things past. Thanks Ed, I now have a clear picture of you and your buddies racing along the tracks, taunting one another! No matter the age the memories are similar and bring a smile to our faces. Glad you had the opportunity to revisit and remember those buried experiences.